You are right to be happy. You are happy because you are home. Yes, you are a third culture kid, and you will always know that. But you have found belonging. Freedom. Awe. Friendship. You have friends at school and friends at church and friends at home. You have a caring family. Everywhere you go, you love and are loved. Your heart is wide. You think you will become a missionary just like your parents. This is because you love all those people so much. Those people who are different than you, but just like you all at once. This is because you love Jesus so much. You don’t know that you will never live overseas like you planned. Instead, you will fall in love. You will marry someone and settle down right there in the place where you started: America. Your world will become much smaller. You will feel disappointed. But you will learn that there are people there in your new world, too. People who are different-but-the-same. Maybe some of them need you. Maybe you need some of them. Maybe ministry will come to mean something different one day, something that is not just preaching behind a pulpit or sweating it out on the mission field. You don’t know that this land you love right now will take your brother from you in a few years. You don’t know that he will leave this world on a road in Phuket, one of the most beautiful places in the world. It won’t make you hate Thailand. It will make you love it even more. You will tie your memory of Will to your memory of Thailand. It will make you hate God a little. For the first time in your life, your faith won’t feel rock-solid. You don’t know that ten years from now you’ll enter another church. You’ll still be a Christian, but you’ll find a depth and beauty of faith that maybe you never realized you were searching for. You won’t know what to say to your church friends from Thailand. You will feel guilty for leaving the church that sent you there, that gave you those people, that gave you that love. So you won’t say much of anything. You don’t know that even though in the early days of being back in the States you will still politely put your feet under your chair when a professor walks in and still take your shoes off at the door, as the years pass, you will become Americanized again. You will care more about fashion. You will wear more make up. You will learn the pop culture TV shows and music. You will settle for the American dream: house, kids, dogs, good job. And Karissa, it will be okay. It will be okay because time changes all of us, and you will have loved ones surrounding you through all the changes. You don’t know that you will be unable to write about Thailand for years and years, and you won’t understand why. Those years were such a part of you – you will be bewildered by your inability to describe them. You won’t find out until almost twenty years from now that third culture kids sometimes experience grief. That they have loved and have lost so much that it hurts. That some days it feels like they will never feel familiar ground under their feet. You will think that maybe you’ve been holding it inside because you could never make sense of all the complicated feelings. You don’t know that almost twenty years from now, you will try to write a book, and in the process, you will break open, and you will finally write about Thailand. You will speak it out loud. You will know that this thing you’ve worn as a badge of pride all these years also touched you so deeply that it hurts. You will know that each goodbye left a scar, but those scars are gifts of grace to your soul. 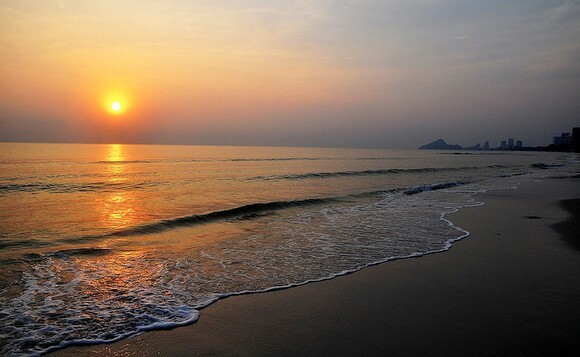 You will bawl your eyes out as you write a blog post, and then you will turn away from the disappointments and the crazy love-grief and you will face healing, and it will look just like a sunrise over the ocean in Hua Hin. Karissa, you are exactly where you need to be, and you are exactly who you are supposed to be. Don’t change a thing about the way you are living: With your arms open wide to the world, with a smile on your face every day, trying to find your way in a “third” culture. Who you are today will bless and encourage the future you. Karissa, I cried (bawled) through this post. You have a gift. This is beautiful and heart-wrenching because I feel the same–from your 10-year younger self who is still hurt and cannot find the words to write about thailand–Thank you. Maybe 10-years from now I will be able to put pen-to-paper without feeling alone and afraid. This post touched my heart and I’m here with tears dripping down my face. Thank you, dear friend. You and I are more alike than you could know. Thanks, Briana. Such hard, complicated feelings. I get it!! Thanks so much for reading, Janneke!!! I enjoyed your blog. I’ll find you on Twitter. Are you writing a book about Africa?